This week of official Princess Week at the Disney Parks, so of course we had to have a Disney Princess Inspiration Board today. This board is a little different than the others, it is to be used as inspiration for separate Princess parties. 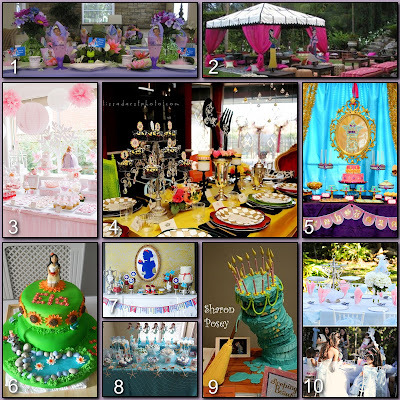 If you follow the links below the party board you will find some fabulous parties, sure to inspire you while your planning the next party for your own little Princess. Tiana - I love all of the detail that went into creating this beautiful table. From the lily pads to the Princess cups to the heart shaped plates. A table a Princess is sure to love. Mulan - A Princess can have an elaborate party, right? Though it is sure to break the bank, I love this tent set up to keep your little Princess's cool on a hot summer day. I also love all of the colorful benches and the life size Mulan cut outs. Rapunzel - So beautiful and elegant, the muted pinks and lavenders are gorgeous. The box stands are fabulous, the paper globes and pom poms are perfect. It took my breath away when I first saw it. Belle - Love the mix and match chairs at the table!! Love the plates and chargers!! Love the crystals hanging from the ceiling!! What's not to love?? Jasmine - This table takes you an a magic carpet ride straight to Agrabah, doesn't it? The rich golds, purples and blues come together to make a party fit for a Princess. Pocahontas - The sunflowers, water, flowers and even little Meeko make Pocahontas feel right at home atop this cake. It would be the perfect centerpiece to a sweets table. Snow White - Snow White's silhouette in the mirror above this sweets table adds the perfect touch. Love the reds, whites and blues used as a different color combination for a Snow White party. The blue bird cookies and candied apples make this table "The fairest of them all." Ariel - This table with it's beautiful mermaid banner, giant sugar coated marshmallows, blue and white cake pop, salt water taffy and sea shells make you feel like you're a part of Ariel's world. Aurora - I love the scene in the move when Fauna is reading the cookbook and making Briar Rose a birthday cake. This cake takes me right back to that scene in Sleeping Beauty, it's genius. Cinderella - What little Princess wouldn't want to dine at this gorgeous table? It has such glamorous little touches - like the feathers, tiaras, slippers, hydrangeas and perfect bows on the back of each chair. Hope you all enjoyed our tour through Disney Princess Partyland. Next Wednesday we will be back to our regular Disney Party Boards. May each and everyone of you have a fabulous Disney Princess Week filled with Pixie Dust!! This is super cute Donna Kay! We are sharing on Guru tomorrow. :0) Hugs! Thank you Kelly!! You are so sweet! !